They say you can't play a sad song on a ukulele. 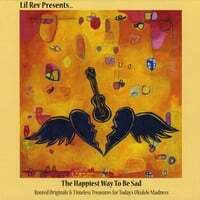 From a quick listen to the track samples of Lil' Rev's new CD, he's split the difference, and found upbeat ways to sing the blues. Think Fats Waller's Your Feet's Too Big. Naturally, it's titled The Happiest Way to Be Sad. Check it out, and buy it here.